Everyone recognizes the haunting space sounds of Moog synthesizers even if they don't know it. It's as pervasive on Sci-Fi soundtracks as on classic pop records. 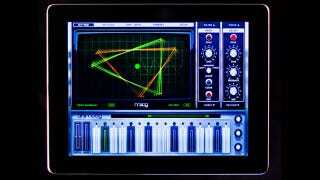 Now Moog has packed that legendary sound into the seriously fun Animoog iPad app. The Moog's new Animoog app jams all of its analog cousin's wizardry into an iPad synth that's as intuitive and satisfying to play as the original. The layout is configured much how you'd imagine it—the piano keys are laid out along the bottom on the iPad's screen. Two of the synth's modules—a delay module for example—are visible at any given time. You can adjust settings like speed and frequency. There's also a big X-Y display on the screen which shows you a jittery, graphical representation of what your sound wave is doing. Sliding the wave form around on this pad modulates the sound. There's other screens that allow you to adjust keyboard's configuration and key settings, as well as a screen for which allows you to add some more advanced modulations and processing to the sound. Basically, there's enough in here to get completely lost in a swirling mess of sound within minutes. The UI is really smart and everything in the app slides, expands and contracts exactly how you expect it to. Settings are savable in case you find some awesome sound, and you can even record your opus once you've got it down. As you might imagine, playing keyboard on a touch screen isn't the same as playing the real thing. Luckily, the app supports an external MIDI keyboard. Once you get going, you end up doing a lot of jumping around from screen to screen because, obviously, you can't cram all of the modules and controls onto one display. Resetting all of the modules should be easier.